You'll BEAUTIFULLY play five different rock songs by The Beatles, Bob Dylan and more - with live jam tracks that will make you sound like part of a real band. You'll play the harmonica with the full, confident tone of a professional. You'll have the ability to play the songs that YOU love out of harmonica tabs websites. Almost ANY song! The songs that you will learn: The Beatles - Let It Be, Leonard Cohen - Hallelujah, Bob Dylan - Knockin' on Heaven's Door, Ben E. King - Stand By Me, The Rolling Stones - Angie, You Are My Sunshine. Bonus: Elvis - Can't Help Falling In Love with You. 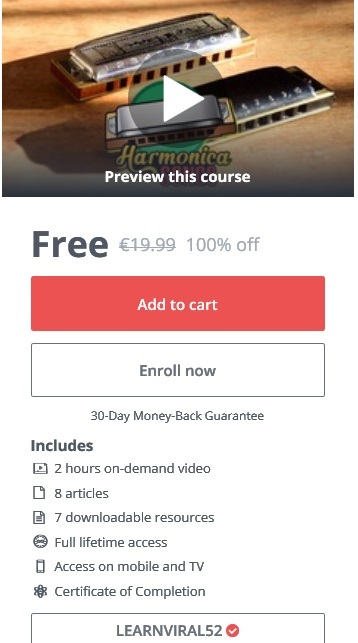 You will cut down months and YEARS off of your learning curve on the harmonica with the techniques you will learn here.